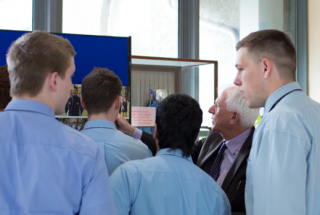 A comprehensive career guidance and counselling service is available to all students at St Vincent’s Castleknock College. The Guidance Department offers students a one-to-one counselling and careers advice service in an attempt to assist students making choices about their lives in three key areas: (i) personal, (ii) educational, and (iii) careers. Parents can meet with the guidance counsellor at information evenings, parent-teacher meetings and through individual appointments upon request. Overcome any information deficit on careers / education. Foster a sense of personal responsibility for identifying future educational / vocational goals. Provide experiences that promote career development and prepare students for the transition to work or higher education. Focus on an individual’s strength and potential so as to create a strategy for promoting discussion around their education / careers / personal development in order to discourage irresponsible action. Introduce and foster a process of evaluating realistically, attainable personal / career / educational goals. Encourage the student to define expectations. The Guidance Counsellor is available for personal counselling to students who may be in difficulty or crisis, and individual counselling is available to all students on request and / or referral. Personal counselling is a learning process concerned with addressing specific issues, making decisions and forming positive action plans in order to tackle the issue in question. This is achieved through supportive listening in an environment which attempts to promote the student’s self-esteem and self-knowledge. Sometimes it is easier to talk to someone about a problem who is not directly involved as they can offer non-biased advice and listen with clarity. This service is there to help students make decisions, to allow them to declare and accept dilemmas, and to assist students in developing an action plan in order to progress. It is important to note that the Guidance Counsellor is not there to judge an individual but to help him explore issues that may be causing concern in order to promote both self-esteem and self-knowledge. The Guidance Counsellor will endeavour to develop a student’s strengths and pinpoint things that may impede progress. Counselling can generate self-awareness and develop personal freedom / responsibility and create a positive self-identity. Counselling focuses on what one is doing and thinking in order to change how one is feeling. The Guidance Counsellor is here to Listen, Accept, Respect, Understand and Respond. Educational / vocational counselling assists the student to grow in self-knowledge and self-esteem by providing information to enable him to make constructive life choices and future plans. Armed with that information, students are then free and responsible for their own choices and actions. The Guidance Counsellor helps the students to recognise the range of alternatives available after completing the Leaving Certificate and assists them to develop the skills to consciously shape their own career path. The Guidance Counsellor will provide students with information and assist in any way possible with various choices. However they will not make decisions for students. Vocational counselling helps students to recognise a range of alternatives and assists them to develop skills to consciously shape their career path. It aims to overcome the information deficit on careers and educational opportunities. It also fosters a sense of personal responsibility for identifying future educational and career goals. Information in class and individual consultation is there for students to think and act upon their future and to discourage irresponsible actions. It helps one to evaluate realistically, attainable career and higher education goals. The Guidance Counsellor is there to assist but students must take the responsibility to participate fully in both the research and decision making process around their future career paths. Students have a vast range of choice in relation to career and educational opportunities but with choice comes responsibility and the consequences of making certain choices. Help evaluate if student’s goals are realistic. Constructive feedback helps the student to choose effectively a life / career path and they are then allowed the freedom and responsibility to assimilate new information and consequently empowered to make educated and pertinent decisions.